What are PROMs? | Whatis Series...? Patient reported outcomes (PROs) are evaluations made directly by patients concerning their health, symptoms, level of functioning, satisfaction with treatment and so on, without any input from their family, carers or healthcare professionals. Patient-reported outcome measures (PROMs) are the tools used to capture PRO information, usually in the form of questionnaires. 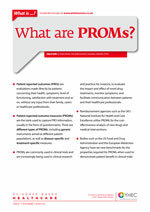 There are different types of PROMs, including generic instruments aimed at different patient populations, as well as disease-specific and treatment-specific measures. PROMs are commonly used in clinical trials and are increasingly being used in clinical research and practice; for instance, to evaluate the impact and effect of novel drug treatments, monitor symptoms, and facilitate communication between patients and their healthcare professionals. Reimbursement agencies such as the UK’s National Institute for Health and Care Excellence utilise PROMs for the cost effectiveness analysis of new drugs and medical interventions. Bodies such as the US Food and Drug Administration and the European Medicines Agency have set new benchmarks for the properties required for PROMs when used to demonstrate patient benefit in clinical trials.